Tallinn will on Saturday become only the second European capital after Copenhagen to host a full-distance Ironman triathlon event, attracting thousands of foreign visitors to the Estonian capital for a five-day sporting event programme. "At least 3,000 people from outside Estonia will be coming to Tallinn for the week to either compete or cheer on [the triathletes], taking part in the inaugural Ironman Tallinn triathlon and other events," chief event organiser Ain-Alar Juhanson said at an event press conference on Monday according to a press release. "Everyone is welcome to come cheer on [the participants]! Tallinn and Estonia will become konwn as an Ironman competition location, and in addition to international recognition as a capital of sports, the Ironman taking place here will have a huge economic impact." "Hosting the Ironman Tallinn competition is an incredible opportunity for a variety of reasons — a new and huge international sporting event is coming to Tallinn which will introduce the city of Tallinn and Estonia to the entire world," said Tallinn Deputy Mayor Vadim Belobrovtsev (Centre). "Organising a triathlon is likewise a new experience, but all obstacles thus far have been resolved in cooperation with various organisations and partners." Juhanson said that the triathlon competition routes were planned so as to impact locals' everyday lives as little as possible. He noted that not a single public transport route would be suspended, but that ten stops in the city would be temporarily relocated. Locals have also been ensured that they will be guaranteed access to and from their homes even along the race route, but organisers are asking visitors and residents alike to take into account when planning that movement through and around route areas may be slow or delayed due to changes in traffic patterns as well as passing competitors. On Saturday, 4 August, more than 1,400 athletes from over 50 countries will compete in the full-length Ironman Tallinn triathlon, swimming a single loop of 3.8 km in Tallinn Bay, biking two loops west of the capital city and back totalling 180 km and running four loops totalling 42.2 km through Tallinn's medieval Old Town before finishing in Freedom Square. The main event will be preceded on Wednesday, 1 August by Pom'bel Ironkids children's competitions and Friday, 3 August by the Seve Ehitus 4.2 km charity run and followed on Sunday, 5 August by the Telia 4:18:4 triathlon. From 1-5 August, a competition centre and sports market will be open to athletes and visitors in Tallinn's Freedom Square. 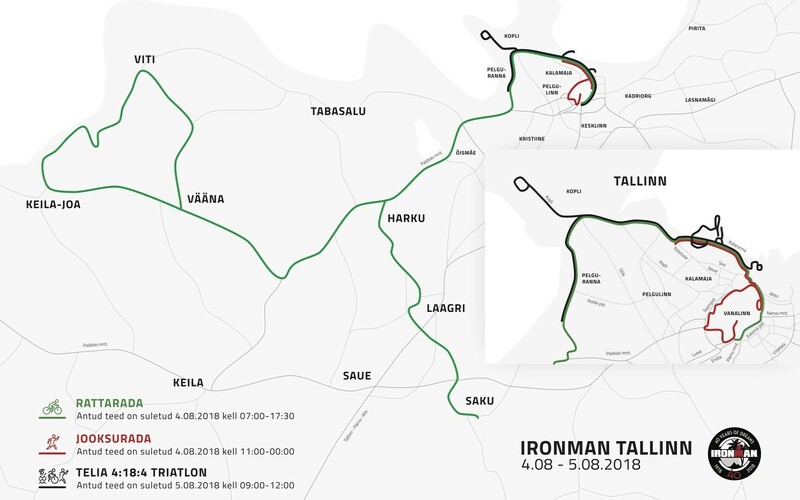 For more information on the Ironman Tallinn, related events and traffic and public transport, click here.